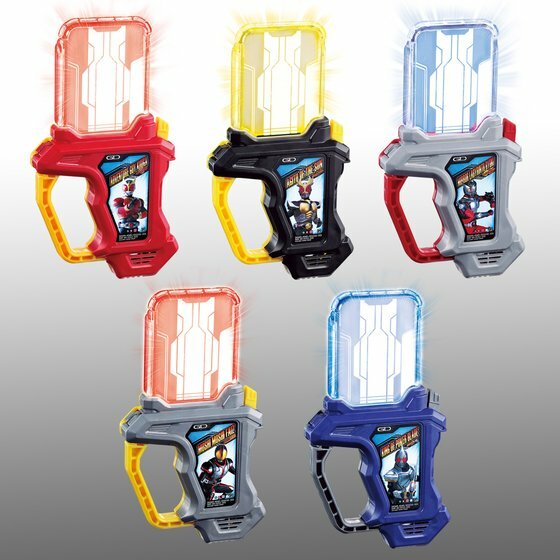 Premium Bandai announced the DX Heisei 10 Legend Rider Gashat Set, a set containing Legend Rider Gashat for Kamen Riders Kuuga through Decade. 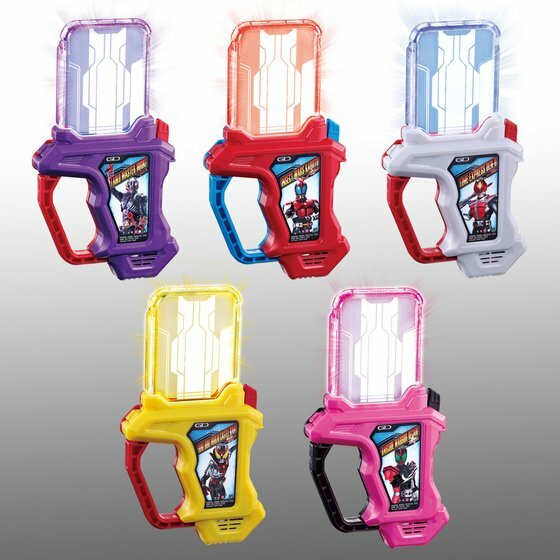 Much like the Legend Rider Ghost Eyecons from Kamen Rider Ghost, the Kamen Rider Ex-Aid set compiles Kamen Rider Kuuga through Kamen Rider Decade in one set, while the newer Heisei Riders of Kamen Rider Double through Kamen Rider Ghost were released through other retail means. All ten Gashat included in this set are of DX build and quality, matching the other Heisei Riders released at retail. Like previously released or announced Legend Rider Gashat, the ten Heisei Riders all star in their own game titled around the events or themes of the series. Each Gashat is colored to mirror the color scheme of each respective main Rider’s base suit in some fashion. 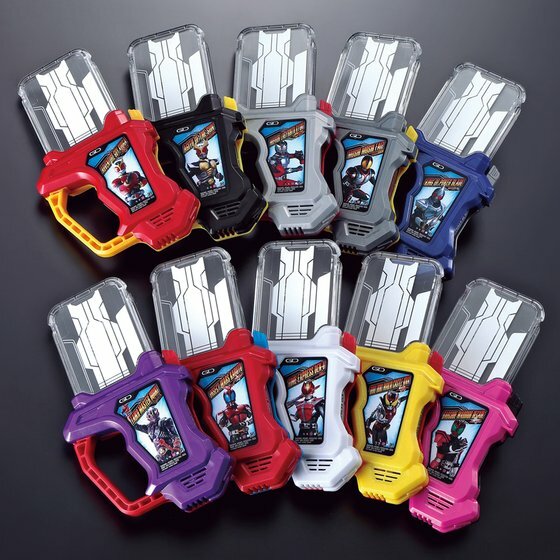 Each Gashat’s “screen” features the title of the game, as well as each Rider in the middle, shining through to the center of the Gamer Driver when inserted and activated. All Gashat activate the “Let’s Ride! Mecha Ride! Mucha Ride! What’s Your Ride? !” Level 1 transformation jingle when inserted. Level 3: Mighty, Dragon! Pegasus, Titan! Rising, Amazing! Ultimate! Kuuga! Level 2: Dragon Knight! Mirror Labyrinth Ryuki! Level 3: Advent! Vent! Vent! Final Vent! Level 2: Moshi moshi Faiz! Moshi moshi Faiz! Level 2: King! King! King! King of Poker Blade! Level 2: Hit! Hit! Hit! Taiko Master Hbiki! Level 2: Den-Den-Den-O! Densha de Sanjou! Jikuu Tokkyuu! Ikuze Climax Jump! (Den-Den-Den-O! The train has arrived! Time Express! Go Climax Jump! The page also reminds collectors that the Drive, Gaim, Wizard, and Fourze Gashat will release at retail stores in February. OOO and Double Gashats will follow in March. The Kamen Rider Ghost and Kamen Rider 1 Gashats were previously released via the All Kamen Rider Rider Revolution 3DS Game and Toei Hero World respectively in 2016. Preorders for the DX Heisei 10 Legend Rider Gashat Set are currently live and will conclude on February 6th, 2017. The Gashat Set will retail for ¥16,200 before fees and shipping and will begin shipping in March, 2017.